Ever wander why do we decorate Christmas trees? used as a symbol of eternal life since the ancient Egyptians and Hebrews. The Scandinavians believed that the evergreen could even scare away the devil. Decorating an evergreen tree in honor of Xmas became popular in the Middle Ages. The decorations then consisted of candles and wafers, to symbolize Christ and the Host. The tree became popular in Europe and America in the 18th century and the Victorians started decorating them with candies and cakes hung with ribbon. Woolworth began selling manufactured Xmas ornaments in 1880. 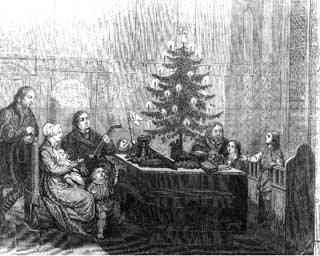 The first electronically lighted Xmas tree appeared in 1882.